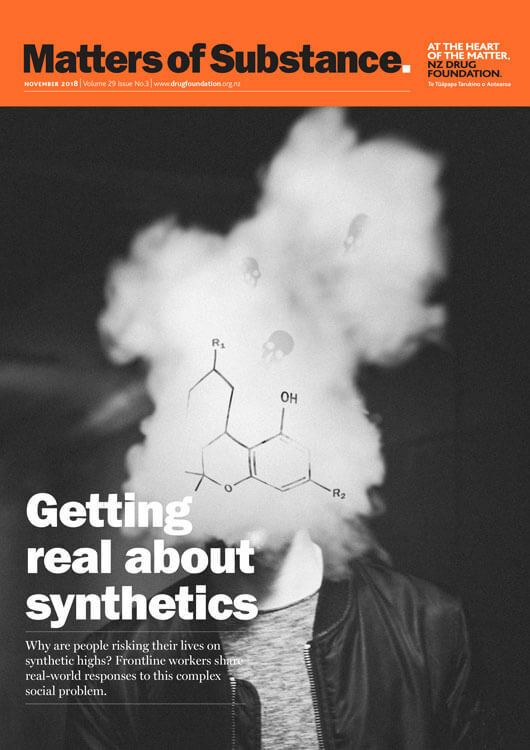 The cover story of the latest Matters of Substance features Lifewise CE Moira Lawler’s take on synthetic cannabinoids, decriminalisation, and “the narrow lens that considers substance abuse in isolation”. Reproduced here, with kind permission, is one part of this article by Naomi Arnold. Please see the NZ Drug Foundation’s website for the full version. Out in the community, Lifewise Trust CEO Moira Lawler does favour decriminalisation. If she were Prime Minister tomorrow and could implement an emergency synthetic cannabis response, she would take away all penalties and exclusion of people who are unwell or using drugs. She says those only further hurt people who are already “completely on the margins”. Together with Auckland City Mission, Lifewise runs a housing programme in Auckland, and Lawler says it’s time to take away the narrow lens that considers substance abuse in isolation. Instead, policymakers should consider what will best suit someone’s entire physical, mental and emotional wellbeing. “People need access to services that can wrap around what they need right then,” she says. “Not a queue of linear services: ‘You can have that, then this, then the next thing’. “We work with people every day who have developed an addiction as a result of their homelessness, so you really can’t discuss their addiction unless you are prepared to discuss their homelessness,” she says. She says evidence shows a harm minimisation approach – which in part accepts that drug use exists along a continuum and is an inevitable part of society – is what’s most likely to help people improve their wellbeing, as opposed to compliance-based approaches. But although clinicians understand it, ‘harm minimisation’ is not a term that’s widely understood by the public, who see it as a soft option. In fact, she says, people with addictions are our most vulnerable and probably have been since childhood. But because the system doesn’t understand the complexity of their situation, they’ve ended up the most unwell and the least likely to be housed. Fixing that means listening to those who have drug addiction – having “a whole-person conversation”. “The thing that’s critical – and sounds like common sense but is not taken into account in the policy framework – is really listening to people who are living with addiction and getting their sense of what’s most likely to be effective,” she says. Society tends to look at drug addiction as a single issue, when in fact it can be just one factor in a host of life problems. Benefit amounts are “unliveable”, and Lawler says in all cases of addiction, lack of housing should be addressed first, without preconditions of access such as abstinence. Ideally, housing would be given within days and then choice and flexibility offered in support. Addressing drug use can come later and should focus on asking the person what they need. “What do you need to have opportunities to contribute to the community? Which, in our experience, people want to do. How does a service come to them and understand the complexity of their lives and what they’re dealing with, rather than expecting that person to fit into a system not geared to deal with complexities. It’s also important to give people access to community-based mental health and addiction services that can help them in their home rather than require them to move somewhere else. She says those services are rationed because they’re so poorly funded, and the people Lifewise helps are very quickly excluded from them. “That’s because they often present as unwell, non-compliant, confused. They are quite quickly either excluded or trespassed, and they just fall off the list. That’s a rights issue in terms of their right to access appropriate care. She says, ultimately, a governmental War on Drugs approach will fail, as it has in the past. “I think the debate about the drug is how we use legislation to prevent people selling it or using it. Though I really understand why people want to stop something so heinous, there is very little evidence that you can legislate drug use out of communities,” she says. In fact, she doesn’t know a single country that has been able to do that. New Zealand should at least be closely observing those processes and what they achieve, she says. This article first appeared in the November 2018 issue of Matters of Substance.